Nearly every day a fluffy white dog with light brown ears and a black collar boards the 9:17 am Red Line train at Chester Street Station, stands or sits at the door, rides two stops, and gets off at Sullivan Street Station. No human or canine companion in sight. The dog then walks across a narrow street to a bakery and sits near the door out of the way of the human customers. In time a bakery worker comes out and puts a pink bakery box on the ground, scratches the dog’s ears, and goes back inside. While the dog eats, two policemen on patrol walk toward the bakery from the subway station. They don’t arrest the dog. Instead they pet, scratch, and tickle him. Mealtime over, the dog walks two blocks on Washington St. to Fire Station No. 17. He barks three times, the door opens, and he goes in. The firefighters enthusiastically greet him. After the hellos the dog jumps into the cab of the Rescue Truck and settles in for a nap. If there is no call, the dog naps for about an hour, has lunch, and leaves the station If there’s a call he often goes with the crew to respond. Like the day of the big fire on Beech St. As the building was being devoured by flames some bystanders began to yell and scream. The firefighters thought the roof was caving in but that wasn’t it. The people were excited because the dog burst through the flames carrying a kitten in his mouth by the scruff of its neck. One of the Rescue crew ran over to help. The dog dropped the kitten near him and ran back into the building. In less than a minute the dog came back with another kitten. Before the firefighter could grab him and pull him to safety the dog ran back into the building and got a third kitten. And just in time. The building fell into a flaming, smoky pile. All the people and animals had gotten out safely. There was an article about the rescue in the newspaper. The firefighters hung it on the fire station wall next to an article about the dog rescuing an elderly lady who’d fallen into Lake Washington. The dog leaves the parking lot and walks to the Washington Park Station, goes down the stairs into the station and boards a northbound Green Line train. He rides three stops and gets off at Washington Park Station. He goes up the the stairs to street level and enters the park. He stops to greet the ice cream vendor (and sometimes get a treat). Then he perches on his special spot on a little hill overlooking Lake Washington. Sometimes he plays with other dogs or children or chases squirrels, but he never goes very far from his spot on the hill. Late in the afternoon the dog walks through the park. He goes to a bench near an old gnarly oak tree and then to another bench near the colorful toy boat house beside the lake. He walks past the now closed-up ice cream cart, down the path to the wash rooms near the kids’ play area, and then back to his hill. He does this twice. Then he leaves the park and walks back to Washington Park Station where gets the southbound Green Line train. He rides three stops to Sullivan Street Station, gets off the train, and walks across the platform to board the 5:07pm Red Line train going east. He rides two stops and gets off at Chester Street Station, where he began his day on the subway. 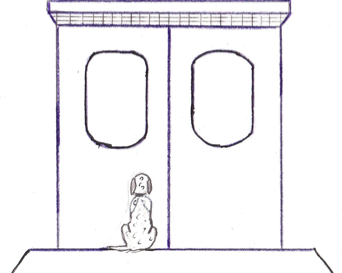 In Chester Street Station the dog stops to visit an old blind man sitting in a folding chair. The man recites poems for people; he has a hat for donations. The dog lets out a little yelp. “That you, Whitey? Time for the daily shake?” Whitey is the name on the metal tag embedded in the dog’s collar. The dog sticks out his paw and they shake. They’ve been friends ever since Whitey chased off some mean boys who were teasing the old man and trying to steal his money. The dog listens to the man recite some poems. He jumps on the blind man’s leg to signal he is leaving. “Adieu,” says the man. The dog then walks on the street where he and his friend John used to live and stops at Barbieri’s Italian Restaurant. The dog goes through a small hole in the back fence and plops on a soft blanket inside a clean, green dog house. Attached to the side of the dog house is a flier with Whitey’s picture and the words “Lost Dog” — Contact the chef in Barbieri’s.” Before it gets very busy inside the restaurant, the waiter comes out the back door and sets a bowl of meatballs in front of the dog house. “Prego,” he says with a slight bow. “Light sauce, a little bread. Just the way you like. Buon gusto, signore Whitey.” Later a cat comes. The waiter gives Whitey and the cat bowls of warm milk. “Buona notte,” he says. Whitey and the cat sleep together in the dog house. In the morning, as he does everyday, Whitey walks to the Chester Street Station, rides two stops west on the Red Line, and gets off at Sullivan Street station. He gets his breakfast treats from the newspaper vendor, flower lady, and bakery worker, and if they are around, he greets the policemen on patrol. He visits Fire Station #19, the Graphics Office at Children’s Hospital, and Washington Park before returning to Barbieri’s Restaurant for dinner and to sleep with his cat friend. At the house’s back door he barks twice. The door opens and he prances into a large recreation room and over to Mrs. Shoner, an elderly lady in a wheelchair. Whitey jumps up on the soft chair next to Mrs. Shoner’s wheelchair and curls into a ball. Mrs. Shoner reaches over and begins what will be a day of stroking Whitey’s ears and back. Whitey began visiting Mrs. Shoner soon after the accident. Mrs. Shoner was visiting Lake Washington with people from the rest home when she accidentally fell out of her wheelchair and landed face down in the water. Whitey was on his hill and immediately jumped into the lake, barking to arouse attention. He swam to Mrs. Shoner and put his head under hers so she could breathe. People quickly rushed over and pulled her to safety. The Rescue Truck from Fire Station #19 and an ambulance arrived within minutes. As she was being lifted into the ambulance, Mrs. Shoner raised her arms and cried out, “My dog. My dog!” Thinking that he really was her dog, the EMTs were about to put Whitey in the ambulance with her, but the attendant from Cedar Creek Rest Home explained that Mrs. Shoner had a very bad memory and that Whitey was probably just a reminder of a different dog in her past. The EMTs drove Mrs. Shoner away, leaving Whitey in the park. The following Sunday, and every Sunday after that, Whitey’s long-time friend John took him on the subway from their house near the Chatham Street Station on the Black Line to visit Mrs. Shoner. After John was unexpectedly taken away from Washington Park in the Fire Station #19 Rescue Truck, Whitey made the trip to Mrs. Shoner by himself. Whitey stays at Cedar Creek with Mrs. Shoner until Monday morning. About 8 o’clock on Monday morning Whitey leaves the rest home, walks down the tree-lined street to the Cedar Creek Station, rides 11 stops on the Orange Line, four stops on the Blue Line, gets off at Hansen Street Station, walks past Barbieri’s Restaurant, and boards the 9:17 am westbound Red Line train at Chester Street Station. He stands at the door, rides two stops, and gets off. No human or canine companion in sight. Many thanks to Miya Shanahan, Stefan Highsmith, Steve Robman, and Henry Weinstein for their astute editing and indispensable encouragement. Copyright © 2015 Eric Golanty.